YPG militants and U.S. troops are seen during a patrol near the Turkish border in Hasakah, Syria, Nov. 4. In an apparent move to appease Ankara, Washington has decided to put a $12-million bounty on members of the PKK's leadership. The move, which many regarded as merely superficial, comes after years of complaints from Turkey that the U.S. was being indifferent to the PKK and its affiliates in neighboring countries. Turkish officials and experts have said that the decision was long overdue and an attempt to persuade Ankara to accept the presence of the PKK-affiliated People's Protection Units (YPG) in Syria. Presidential Spokesperson İbrahim Kalın said Tuesday that Turkey will "approach the late move cautiously," emphasizing that if it was done to cover Washington's support for the YPG, the truth will come out soon. The U.S. State Department's Rewards for Justice Program on Tuesday authorized up to $12 million in rewards for information leading to the identification or location of the senior members of the PKK, which has claimed the lives of more than 40,000 people over a 30-year-long terror campaign against the Turkish state. The U.S. Embassy in Ankara said in a statement that Washington approved up to $5 million for information on the PKK's acting leader Murat Karayılan, $4 million for Cemil Bayık and $3 million for Duran Kalkan. Justice and Development Party's (AK Party) Diyarbakır Deputy Mehdi Eker said yesterday that the U.S.' reluctance to take steps in northern Syria's Manbij, despite the agreed roadmap, was a sign of its intention to substitute the YPG with the PKK. He said the latest decision should be considered in this context. Turkey and the U.S. agreed on a roadmap for Manbij in June that foresaw the expulsion of the YPG and its affiliates from the city. However, six months have passed since the agreement and the YPG continues to be present in Manbij. It even began digging ditches and trenches against a possible Turkish offensive, according to local reports. Eker compared Washington's decision to place a bounty on PKK leaders to the "handing over of PKK leader Abdullah Öcalan with the condition of not sentencing him to death. "It is just another phase, sacrificing the outdated structures and replacing them with new ones," he told a panel organized by the Foundation for Political, Economic and Social Research (SETA). Although the U.S. recognizes the PKK as a terrorist organization, it denies the group has any connection with the YPG, despite their strong organizational and ideological links. Both groups have been operating under the umbrella organization the Kurdistan Communities Union (KCK) and regard PKK's imprisoned head Öcalan as their leader. Unlike the PKK, the U.S. does not recognize the YPG as a terrorist organization, James Jeffrey said yesterday, while adding that they understand the security concerns of Turkey over the two organization's link with each other. Speaking during a press teleconference, Jeffrey said that the U.S.'s position over the PKK is clear, implying that they recognize it as a terrorist organization. "We understand Turkey's concerns over the link between the PKK and the YPG. That is why we are acting quite carefully. [Before doing anything] we inform Turkey first about what we do and why we do it [in the region]," Jeffrey said. Stating that U.S. will do anything to prevent any concrete threats from northern Syria to Turkey, Jeffrey said that they only give light weapons to the terrorist group due to Turkey's concerns. "They say they are making a distinction between the PKK, the YPG and the Democratic Union Party (PYD), but they cannot fool us. We have told them many times that the organic link between them [the PKK and YPG/PYD] is not [purely] instrumental," Kalın said. 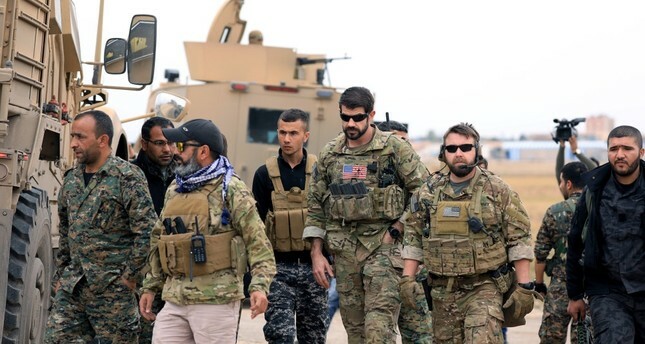 Since 2014, the U.S. has provided military support for the YPG terrorist organization, under the pretext of fighting Daesh. It facilitated the groups' efforts to form an autonomous region, a major sticking point in U.S.-Turkey relations. The U.S. has provided military training and truckloads of weapons despite Ankara's security concerns and warnings. Defense Minister Hulusi Akar also commented on the issue yesterday, calling Washington's decision "a positive but late move." He called on the U.S. to take a similar approach toward the YPG, which is "not different than the PKK." "We find it unacceptable that while rewards are being put on PKK leaders, truckloads and planeloads of weapons and military equipment are being delivered to the YPG," the defense minister said. Nihat Ali Özcan, an academic at TOBB University of Economics and Technology, said Washington likely made the decision after contemplating Ankara's messages and the current situation on the ground in Syria, for a long time. He said that Turkey's recent signals about a new operation to clear YPG presence from its borders may have pushed Washington to make such a move. In his response yesterday, Foreign Ministry spokesperson Hami Aksoy said that Turkey expects this step to be supported with concrete actions in Iraq and Syria, in the context of fighting the PKK and its extensions. Ankara has long voiced its discontent over Washington's inconsistent Syria policy and its reneged promises over ending military support for the YPG. Ambiguous and contradictory remarks from U.S. foreign policymakers and the U.S. Central Command (CENTCOM) figures have only heightened Ankara's concerns. Kılıç Buğra Kanat, the Washington D.C. research director at SETA, said that Washington's confusing moves over the last few years and alleged foreign policy divergences between state institutions have made U.S. allies to question its credibility. "These U-turns have been interpreted using the good cop-bad cop argument, which is not true. In fact, White House simply doesn't want to be a cop and spend money on external conflicts," he said.